Brewing coffee is a morning routine for millions of people and research has shown that drinking coffee comes with a number of health benefits. Coffee is associated with reduced risks of Parkinson's disease, type II diabetes and liver disease. Studies have shown that green tea could help improve your vision healthy but could your morning cup of coffee also protect your eyes? A new study has found a link that supports that theory. The study from Cornell University was published in the Journal of Agricultural and Food Chemistry and found that one of the main ingredients in coffee may protect against blindness and eyesight deterioration that comes with age. In the study mice were treated with nitric acid which leads to retinal degeneration. However, some mice were pretreated with chlorogenic acid or CLA, one of the main ingredients in raw coffee. The study found that the mice that had been treated with CLA did not exhibit retinal damage. Scientists think that this is significant because it could lead to synthetic compound for human use. This study suggests we may need to add coffee to the list of foods that are good for your vision but where does it fit in with the rest of your diet? What foods should you be eating to help maintain healthy eyes? 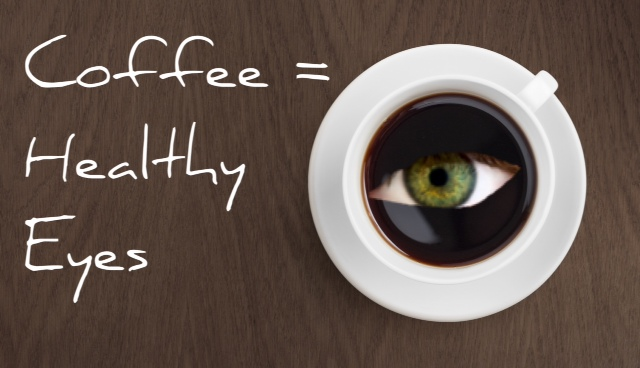 While it seems that the benefits of coffee could extend your eyesight, there are other dietary steps that you can take to keep your eyes healthy. Studies have shown that nutrients like Omega-3 fatty acids, lutein, zinc and vitamin C and E may help to ward off age related eye problems. Eating a balanced diet is also important because it greatly reduces the risk of type II diabetes and diabetes is the leading cuase of blindness in adults. Spinach , kale and other green leafy vegetables. These foods include the antioxidants luteins and zeaxanthin which act as a kind of sunscreen for the eye. Our bodies don't produce these antioxidants on their own so we have to get them from our diet. Salmon and oily fish. Salmon is rich in Omega-3 fatty acids and B-vitamins both of which can help to protect your eyes. Oranges and other citrus fruits and juices. These fruits are full of Vitamin-C one of the crucial vitamins for eye health. Nuts, eggs and other non-meat protein soucrse. Nuts and butters that can be made from them are rich in Vitamin-E and are essential for a healthy diet. Our bodies depend on what we put into them and a healthy balanced diet is one of the best ways to not only protect your vision but your overall health as well. If coffee does have the vision health benefits that this study suggests, your morning routine may already be doing you more good than you know. My sincere and grateful thanks to Mr. Behrooz Golchin for his expertise and kindly consideration and care.